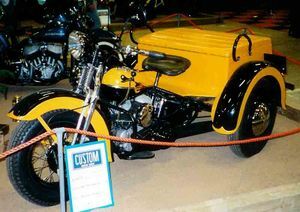 The Harley-Davidson Servi-Car was a three-wheeled utility motorcycle manufactured by Harley-Davidson from 1932 to 1973. The Servi-Car was designed during the Great Depression when Harley-Davidson was desperate to expand its product base to increase sales.. Targeted at the automotive service industry, the vehicle was designed to be towed behind a car to be delivered to a customer; when the car was delivered at its destination, the driver would unhitch the Servi-Car and ride back to the garage. For this reason, it was available with a tow bar at the front and a large 60 Ah battery. Originally intended for mechanics to collect vehicles for repair, it proved ideal for traffic police and meter maids, becoming something of an American institution. In addition to its intended use for car delivery and retrieval, the Servi-Car was also popular as a utility vehicle for small businesses and mobile vendors. They proved to be particularly popular with the police departments, some of which still used Servi-Cars into the 1990s. In 1933, the GDT, with large box and tow bar, was added to the line. In 1942, the small and large boxes were replaced with a standardized intermediate-sized box that was manufactured for Harley Davidson by the Chas. Abresch Co. in Milwaukee, Wisconsin. A gold, red, and black water transfer decal from this company was affixed to the top inside of the box lid. This box lasted until 1966, after which it was replaced by a fiberglass box; all preceding boxes were made from steel. The engine initially used by the Servi-Car was the 45 cubic inch flathead used in the 1932-36 R model. It was changed in 1937 to the engine used in the W model, which differed mainly in having a recirculating oil system instead of the constant-loss system of the R. The "W" flathead engine continued until the end of production in 1973, despite the "W" solo series being replaced by the "K" series in 1952. 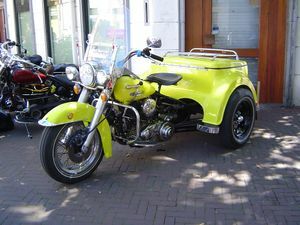 An electric starter became available on the Servi-Car in 1964, making it the first civilian Harley with an electric starter, one year before the debut of the Electra Glide. The Servi-Car was designed for the road conditions of the day, where surface roads might still be crude and unpaved. It had a rigid rear axle with a differential. The rear axle had a track of 42in, similar to the track of most available cars. This was done so that the vehicle could use the same tracks that had been made by regular cars. Until 1957, the front forks of the Servi-Car were the springer-type leading-link forks used on the R-series and W-series solo motorcycles. From 1958 on, the Servi-Car would use Hydra-Glide front forks. As introduced, the Servi-Car had a drum brake on the front wheel and another drum brake inside the rear axle housing, decelerating both rear wheels. In 1937, the braking system was upgraded to have a drum brakes on each wheel. A hydraulic rear brake system was introduced in 1951. The very last Servi-Cars, built late in their last model year, would have disc brakes on all three wheels. This page was last edited on 23 August 2010, at 23:14.